In your business as well as personal lives, wisely invest your most precious and constantly diminishing asset in 2013 … TIME. 1. Your Mission: You need to define your life’s overall mission in order to know how to expend your time. Even though I am not formally religious, mine is a little like the Dalai Lama’s advice. I seek to “to maximize my happiness and health without hurting anyone else and ideally paying if forward, helping and giving back to others”. “You only live once, but if you do it right, once is enough.” … Mae West. “Everything you can imagine is real.” … Pablo Picasso. 2. What you value: Also discover what you value in life. When you know whether you value family or career or spirituality or personal development or whatever, you will, moment by moment, gauge whether you are spending your moments wisely. “Today you are You, that is truer than true. There is no one alive who is Youer than You.” … Dr. Seuss, Happy Birthday to You! 3. Your Portfolio: Your life is a portfolio of projects. Apply PMI’s project portfolio practices to ensure that you spend your time intelligently in relation to your mission, strategy and what you value. “You’ve gotta dance like there’s nobody watching, Love like you’ll never be hurt, Sing like there’s nobody listening, And live like it’s heaven on earth.” …William W. Purkey. 4. Steven Covey’s Habit #2: Begin with the end in mind. Exploit Steven Covey’s famous 2nd habit to imagine it is the END of 2013. “Life can only be understood backwards; but it must be lived forwards.” … Søren Kierkegaard. 5. EVERYONE is UNIQUE and SPECIAL And nobody (OK maybe Angelina is for me 🙂 is perfect. Leverage your strengths and compensate for your weaknesses. Be the best you can be! “Who are you to judge the life I live? I know I’m not perfect – and I don’t live to be- but before you start pointing fingers… make sure you hands are clean!” … Bob Marley. “A life spent making mistakes is not only more honorable, but more useful than a life spent doing nothing.” … George Bernard Shaw. 6. Control what you can. “Time = Life, therefore, waste your time and waste of your life, or master your time and master your life.” …Alan Lakein. So, always control yourself! Especially discipline your attitude to always be positive and to problem-solve what you can and should. “There are only two ways to live your life. One is as though nothing is a miracle. The other is as though everything is a miracle.” … Albert Einstein. 7. Don’t try to control or manipulate what you shouldn’t, like someone else’s time, money and life. “Respond to the many types of unfair persuasion. Transform yourself from a manipulated target and victim into a superior decision-maker and a clear-thinking master of your mind, actions and project outcomes”. 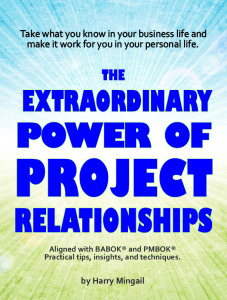 … Harry Mingail’s e-book The Extraordinary Power of Project Relationships. 8. Accept and adapt to what you can’t control. If you have bad health, don’t waste your time feeling sorry for yourself but rather be as healthy and happy as you can be. In USA, since Democrats can’t control the Republicans and vice versa, COMPROMISE to save the country and the world from the negative effects of the “fiscal cliff”. Don’t waste you energy. You can’t make the sun not rise. It’s always there somewhere, even if it is behind clouds. “Insanity is doing the same thing, over and over again, but expecting different results.” … Narcotics Anonymous.